Modern home decorating ideas and bright color combinations, inspired by blooming gardens, are created by designer from Brazil Neza Cesar. Her home interiors are not only cheerful and colorful, but demonstrate gorgeous color design in accordance with good Feng Shui. Classic look of vintage furniture and accessories in vintage style are perfectly blend with bright room colors and wall decor, creating pleasant and cheerful interior decorating schemes. Bright colors used for house exterior and interior walls, outdoor home decor and interior decorating create harmony and delight with continuity. Bright colors are modern trends in home decorating. 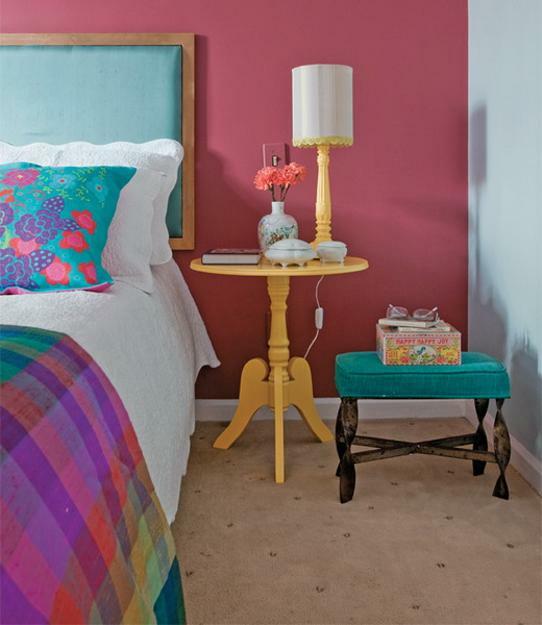 Safe and cozy neutral colors are complimented with bold, optimistic and energetic hues. Bright room colors that look even brighter with neutral colors that, highlight the safety and warmth of home interiors, create happy, romantic and joyful interior decorating. Walls in neutral colors ask for creating a bold and beautiful accent wall decor. Bright colors and home decorating color combinations beautify kids rooms and bring energy and excitement into living rooms and master bedrooms. The late 60s and early 1970s inspire colorful interior decorating ideas that transform bathrooms and kitchens, turning living spaces into playful, energizing and stylish rooms. 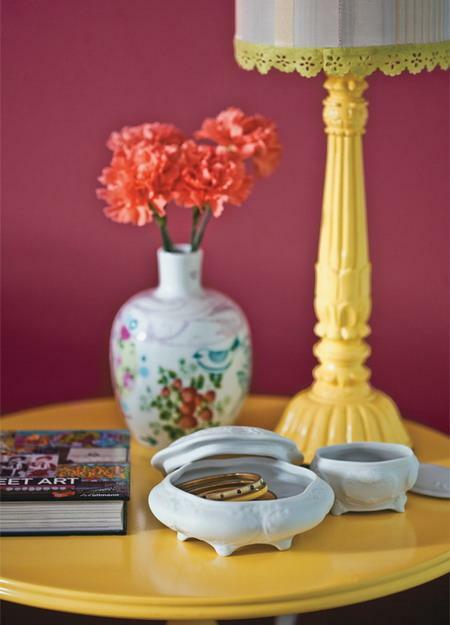 Bright decorating colors bring dramatic changes into interior decorating. Wide stripes on walls, modern prints and art works, colorful accent walls and home furnishings create spectacular color combinations and allow to Feng Shui home interiors with color. Soft neutral colors, like light gray color and off white paint colors, a touch of black all brown color shades look fantastic with lavender and deep purple color shades, turquoise blue and green colors, sunny yellow color shades, orange and passionate red colors. Modern trends in home decorating give great inspirations for bringing more color into homes. 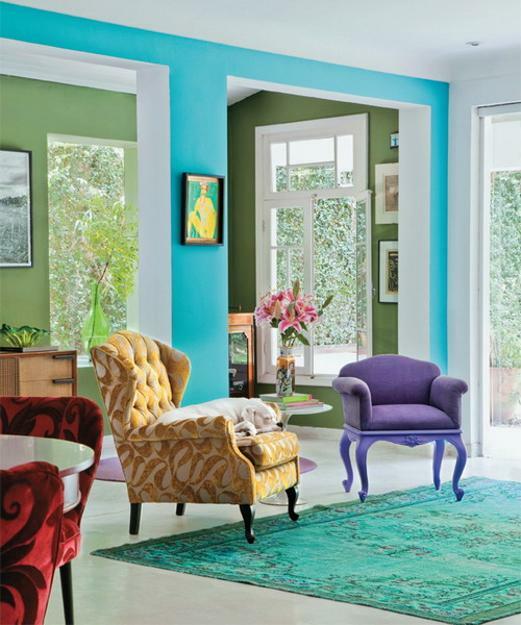 Men and women appreciate colorful accents and are willing to experiment with color design today. People are craving changes, and color allows to transform interior decorating with bright, creative and stylish home decorating ideas that improve mood and make them feel cheerful and energetic. Bright room colors and home decorating idea help leave the troubles behind the doors and celebrate the spectacular, dramatic and unique interior decorating and outdoor home decor. 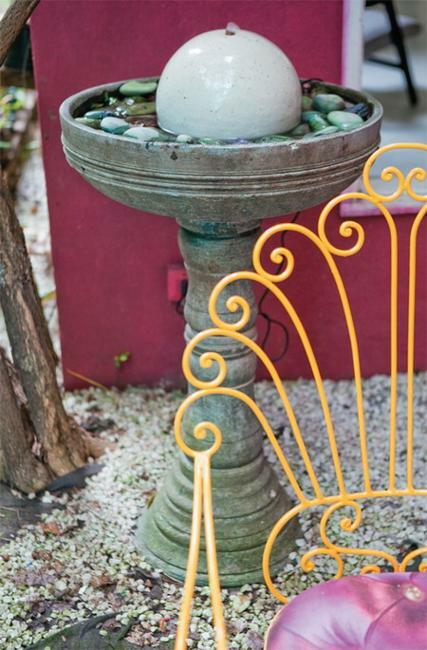 Bright room colors and vivid hues in outdoor home decorating are an indication of better days ahead, happiness and joy that people want to feel and see in their outdoor living spaces and interior decorating.